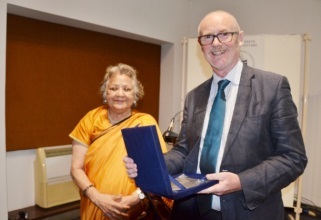 David Blayney Brown receives an inscribed plaque from Mrs. Asha Sheth, Chairperson, Vasant J. Sheth Memorial Foundation, January 24, 2017. Professor Diana L Eck receives an inscribed plaque from Mrs. Asha Sheth, Chairperson, Vasant J. Sheth Memorial Foundation, January 19, 2016. Ms. Ketaki V. Sheth greets Professor Sugata Bose who delivered the 15th Vasant J. Sheth memorial lecture. 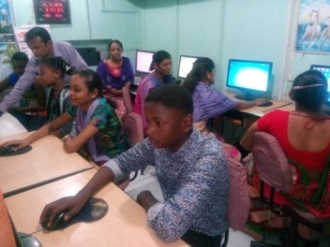 Workshop on the importance of marine ecology and wildlife conducted by the Vasant J. Sheth Memorial Foundation in collaboration with Srushtidnyan (environmental NGO) at the Children’s Toy Foundation, Matunga, Mumbai. 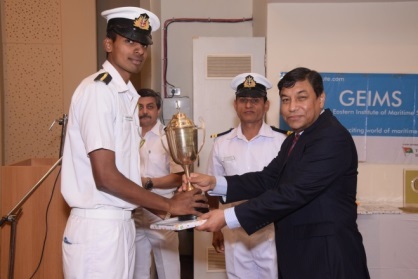 ‘Vasant Sheth Scholarship’ being awarded to a cadet of the Sri Venkateshwara College of Engineering, Chennai, Tamil Nadu. 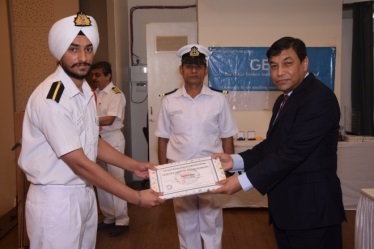 Vasant Sheth Scholarship’ and certificate being awarded to a cadet of the Great Eastern Institute of Maritime Studies, Lonavala, Maharashtra. Municipal school children at the Vasant J. Sheth Memorial Sea Turtle Interpretation Centre, Rushikulya, Orissa, as part of an education programme for the importance of conserving the Olive Ridley sea turtle species. Dr. Nigel Erskine, Head of Research, Michael Crayford Assistant Director – Collections & Research and Johanna Nettleton, Designer of the Australian Maritime Museum, Sydney at the workshop conducted in collaboration with the Vasant J. Sheth Memorial Foundation in Kochi, Kerala, for students who want to pursue a career in museology. Mrs. Asha V. Sheth, Chairperson and Arundhati De of the Vasant J. Sheth Memorial Foundation, the team from the Australian National Maritime Museum, Sydney along with the candidates of the workshop in Kochi, Kerala. 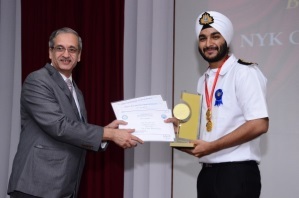 Mr. Karan Shah, Grow Trees, presents an e certificate to Sir Robert Swan. 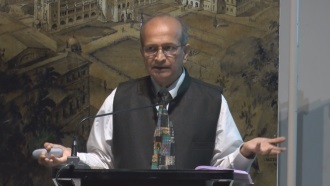 A grove of 50 trees have been planted in Dwarka, Gujarat, by the Vasant J Sheth Memorial Foundation in honor of Sir Robert’s extraordinary achievements. Sir Robert Swan, Mr. Prashant Shinde and Sangita Kharat (Srushtidnyan), Mrs. Reshma Piramel and Mrs. Asha V. Sheth.